During severe allergy attacks, the quick administration of an epinephrine auto-injector, commonly known as an EpiPen, can make the difference between life and death. Unfortunately, researchers from Northwestern Medicine and the Ann & Robert H. Lurie Children’s Hospital have found that parents of children with life-threatening allergies often aren’t given instructions on how to make proper use of this vital tool. The study surveyed 859 parents in the Chicago metro area and looked at two factors. The first was whether their physicians or allergists had provided instructions on how to make use of an auto-injector. The second was whether the parent had been provided with a written emergency action plan—a list of common food allergy symptoms and recommended actions in case of mild, moderate, or severe allergy reactions. These plans are typically given to all caregivers of a child with a potentially serious food allergy. The results of the study indicate that less than 40% of parents received advice from their pediatrician on how to identify when an auto-injector was needed and less than 70% received such information from an allergist. More concerning was how even fewer parents were provided with an emergency action plan or even shown how to actually administer the epinephrine dose. Part of the reason pediatricians offer the guidance so infrequently is that they are themselves unsure. Past findings have suggested that a majority of pediatricians are in fact not given proper training on how to use an auto-injector. If the doctor isn’t confident in their own knowledge, then it is less likely they will try and pass that information on to the patient or parents. The researchers suggest that improved training as well as instructions on methods to ensure that parents understand what is being said could be used to improve awareness and preparation in event of an allergy attack. The study did not cover whether the parents in question actually knew how to use an auto-injector or knew how to recognize when they were to be employed. It focused primarily on the physician-patient relationship and what information, if any, was provided. Roughly eight percent of children in the U.S. have some form of food allergy and the most commonly reported triggers are peanuts, milk, eggs, and tree nuts. About half of all child food allergies can produce a severe reaction, characterized by the throat swelling enough to cut off the airflow (anaphylaxis). 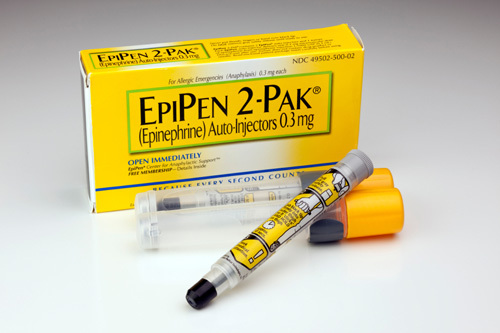 “Parents in Dark about Using Epinephrine Shot for Kids’ Food Allergies,” EurekAlert! January 12, 2016; http://www.eurekalert.org/pub_releases/2016-01/nu-pid011216.php.